The cassava, like yam, is staple in the Liberian and Sierra Leonean diet, as is rice. It’s never really been a part of my diet, having only ever had it in the form of cassava fufu, which I’m not too keen on. 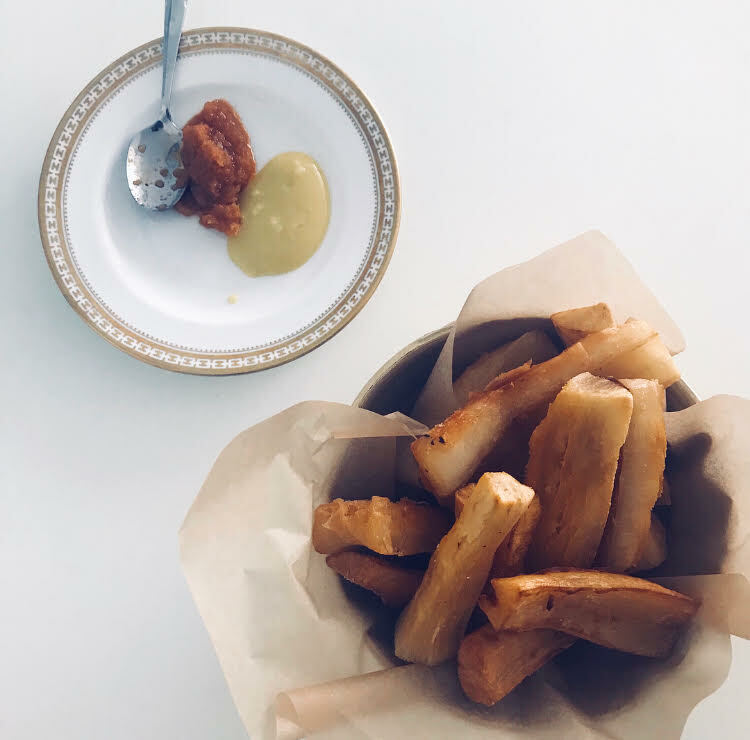 Though during spring this year I rediscovered it and became a little obsessed with making cassava chips – YUM. Cassava has a woody and waxy two layer skin and is woody in texture and flavour. The core, like the core of a pineapple, is hard and stringy, and needs to be removed before cooking. Honestly, I’m not dashing potato chips but once you try making cassava chips you’ll become as obsessed as I am. Enjoy with CHAM CHAM Hot Pepper Sauce or my scotch aioli! Bring a pot of water to boil, turn down the heat and add the cassava chips to the pan and cook for 20 minutes. Drain and sit on kitchen towel or a tea towel to drain any excess water. Put the vegetable oil onto heat. You want to fry them first at 130C for 7 minutes. Remove from the oil and let the oil now reach 180C, and fry once again.